As a life-coach I help those who are facing serious choices in their relationships or careers. My expertise is in helping my clients make the best possible decisions in their life. Hi Dr Daniel, I would like to speak with you briefly to see if you're a good fit to coach me. Please contact me at your earliest convenience. I am a seasoned and highly experienced Career, Executive, Relationship-Life Coach with decades of experience.I have several degrees including an MBA, PhD and DBA in business administration. I also have an MD and an ND degree. I have helped tens of thousands of people in my career. I specialize in helping my clients during their most difficult times when they are facing serious decisions which would have tremendous impact in their life. I help these individuals make the most effective, appropriate and beneficial decision that would add tremendous value in their life long term. As an experienced and seasoned life coach who helps his clients by aligning their psychological mindset and spiritual beliefs in order to help create life success for them; my focus is in creating positive results. As in everything I do, in coaching also I am very result oriented. Additionally I am a Business Leadership Coach as well. I specialize in streamlining the established businesses and coaching entrepreneurs in overcoming various obstacles by making the correct decisions in every stage of their business development, all based on management science and first-hand experience. It is my specialty to coach entrepreneurs so that they can create a great fully functioning business that makes them money and affords them a great quality of life wherein they can also achieve all the other life-plans they have set for themselves. Have you worked with Dr Daniel? Tell your friends! Dr Daniel doesn't have any reviews yet. You Can Master Sales Leadership For your Business. In this article Dr. New Me has described the science and the skills behind creating an extraordinary sales force. Learn to Create Your Ultimate Life! 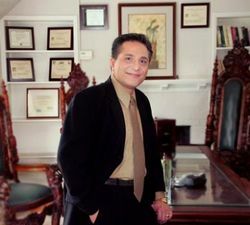 Dr. New Me (Dr. Daniel S. Sheibani Davidson) www.PsychospiritualCoach.com has discussed how one can create a life one desires. Introducing PsychoSpiritual® Coaching by Dr. Daniel Shane Sheibani Davidson. Dr. Davidson, a trained physician introduces a specialty he has created and has been practicing for decades called Psychospiritual Coaching. How to achieve business "Automatization"? In this article you get a more coaching outline of business "Automatization". The average business owner is usually a prisoner. Instead of owning the business, the business owns him. Break FREE.